More than any other aspect of Hip-Hop culture, graffiti and breaking captured my imagination as a child. The acrobatics of break dancers was a revelation to me. I often felt jealous that my wiry, uncoordinated body could not execute those moves. Graffiti was something that came to me a little more naturally. I had a natural artistic ability that I inherited from my father. One of my older cousins showed me how to do bubble letters and simple characters. While I didn't even qualify as a "toy", I felt a certain kinship to graffiti writers. When I finally saw Beat Street on HBO in October of 1985, it only piqued my curiosity further. It romanticized the lives of New Yorkers as no other film could. As the 5 train roared past my suburban Bronx neighborhood on its way to and from the Gun Hill Road station, I imagined the adventures that could be had using it as a canvas. Graffiti writers embody the inherent outlaw spirit of Hip-Hop, and I'm not talking about gangsterism. That era has long since passed, and with it any opportunity to mine the exploits of graffiti writing for its inherent drama. These are artist who are willing to risk their freedom and their lives for the art. Their only reward is personal satisfaction and recognition. Rap music have been the most marketable aspect of the culture, but Graffiti represents something much more mysterious and adventurous. Prowling train yards and subway tunnels, carrying bags of spray paint looking for nice clean train to victimize. How could a mere rapper compete? 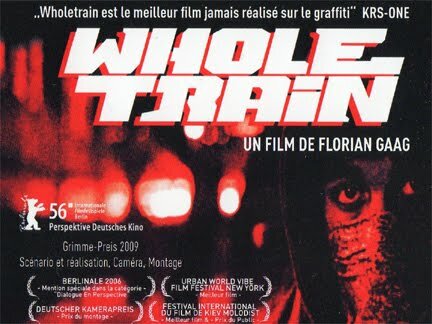 Perhaps sensing the void that exists for appreciators of Subway art, German filmmaker Florian Gaag has made Wholetrain. Not so much a throwback to an earlier era as it is a voyeuristic peak at how an artifact from that era still thrives in other parts of the world. The film centers on a crew of writers whose lives revolve around bombing trains and walls, smoking weed and partying. The responsibilities of adulthood are mere annoyances. David (Mike Adler), Tino (Florian Renner), Elyas(Elyas M’Barek), and Achim (Jacob Matschenz) have one concern in life: graffiti. Whether adorning commuter cars with "burners" or walls with "pieces" and tags, these four are addicted to leaving their mark. 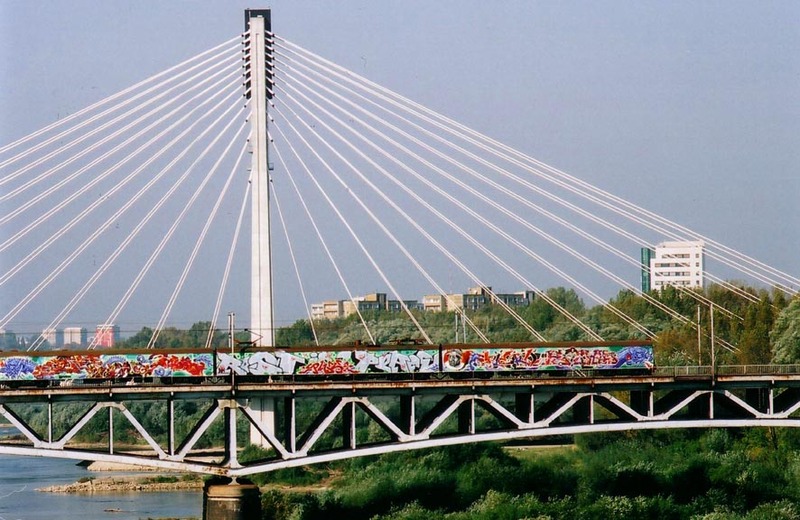 When they aren't vandalizing, they are holed up in each others apartments smoking weed and filling their black books with abstract masterpieces. They make time for women, but anything that doesn't involve markers and spray paint is relegated to a side concern. David, the de facto "alpha male" and protector of the group is at a cross roads. He has run afoul of the law one too many times. Any further indiscretions will result in jail time. Tino is a young father who barely lives up to the responsibilities implied by the title. Achim is a young prospect who is favored by David but shunned by the other crew members. As if these internal conflicts weren't enough, the winds of change are blowing through town in the form of a rival crew known as ATL. ATL bring a more advanced sensibility to their burners that makes the efforts of David's crew seem antiquated. Amidst the turmoil, the foursome set out to bomb an entire "wholecar". This is dangerous as it is a time consuming effort that leaves them exposed to the cops that prowl the train stations. As all these situations reach a head, the foursome are forced to make a choice: adapt to the changes and become men, or succumb to the walls and trains that beg to be beautified by aerosol paint. Florian Gaag employs a visual style that emphasizes the small scale but risky lifestyle of the principles. It's a no frills affair. The camera work makes the viewer feel like an eavesdropper or a peeping tom, peering over the shoulders of the actors. The expeditions into the train stations at night play like black ops. Everything is supported by a screenplay that never feels the need to offer overly heightened situations to ratchet up the drama. Everything unfolds in a probable, believable manner. There are some rather obvious nods to genre standards like Wild Style and Beat Street that never feel forced or intrusive. Wholetrain is a small, simple film that suffices as a serviceable coming of age tale. Florian Gaag has an obvious respect and affinity for this world that is obvious in every frame. In an era where rappers and rap fans openly champion material rewards as the only purpose for the culture to exist, Wholetrain shows serves as a reminder of what it truly means to live and sacrifice for your art. While that may be an antiquated and naive notion, it's nice to know that it still exists in some form. Do they like film this illegally when they﻿ paint the trains or something.